Honestly, not a bad value for what all I’m getting, but still, 400$+ all at once is a bit of a blow. I’ll get some back when I return the calipers. I was ecstatic to see the master cylinder be under 20$. The slave cylinder was just 26$ at a brick and mortar store. Overall, this represents the majority of actual parts needed to get the fiero back on the road. The O2 sensor was brand new, spark plugs were clean, air filter was new, fuel filter was recent enough, gas tank was drained and looks good, brake master cylinder and booster are newer, and the hoses and lines look in good shape. 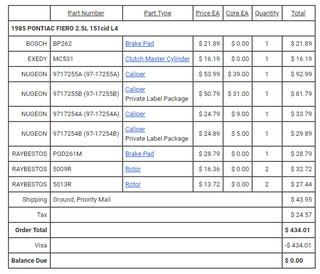 I think this should be all I need to let the Fiero hit the open road again soon.